In some California cities, brown is not quite the new green. In fact, it's downright illegal. 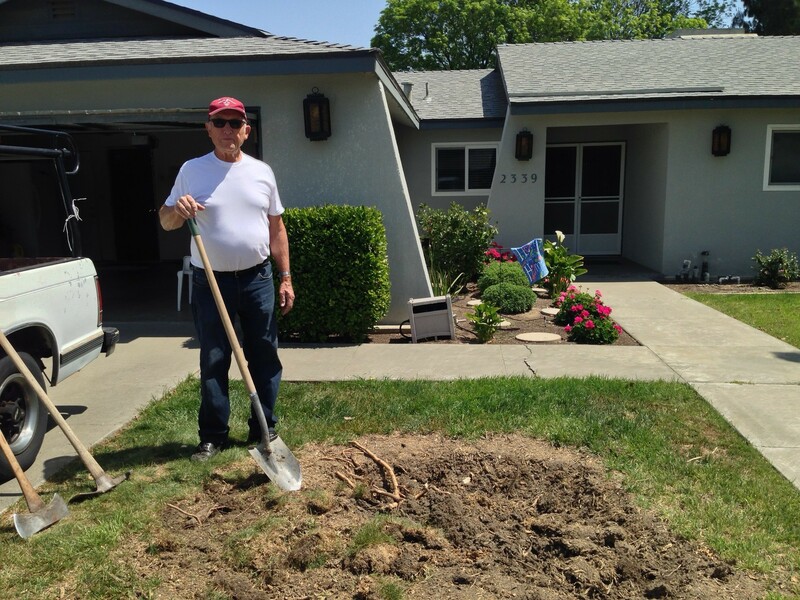 Take the Kings County city of Hanford, where we found Tim Atkinson taking a pickaxe to his lawn, sweating and huffing as he hacked away at a stubborn root. He was pulling out some grass and putting in a rock planter to help save water. "Inside, we’re going to put blue rock," says Atkinson, a retired paint store owner. "It’ll be decorative." The problem is that in Hanford, it's against the law. "The current code requires that you plant your front yard in primarily living materials, which include turf, shrubbery and trees," explains Darlene Mata, Hanford's community development director. She oversees code enforcement for this city of about 56,000. Mata and city manager Darrel Pyle drive me through town and stop in front of a house where the homeowners have clearly decided to turn off the sprinklers. "The way the ordinance is currently written," says Pyle, "this lawn would be deemed to be unmaintained, but he’s not using any water to irrigate, so right now, we’re looking at what is the lesser of two evils?" Mata points to a neighboring house with a rock garden like the one Tim Atkinson wants to put in. "The problem we have now, people are requesting to put concrete, rock fronts with minimal shrubbery or put artificial turf. All of those are non-living materials," he says. "Currently we can’t approve that." People who do put in fake grass or rock gardens run the risk of having to pull them out if the city catches them. "The current ordinance requires that we tell people no, but we realize some of the things [homeowners] are asking us to do would be beneficial to the community and to the state as a whole," says Mata. "So when our code is no longer logical, that’s the predicament we’re in," adds Pyle. The city’s stopped sending warning letters to homeowners violating the "living landscape" ordinance and is no longer issuing $500 a day citations either. Instead, local officials are working on changing their ordinance. Hanford’s anticipating a state mandate to cut water use by 32 percent or face penalties. In the meantime, Atkinson’s hoping city officials look the other way when it comes to his rock garden. 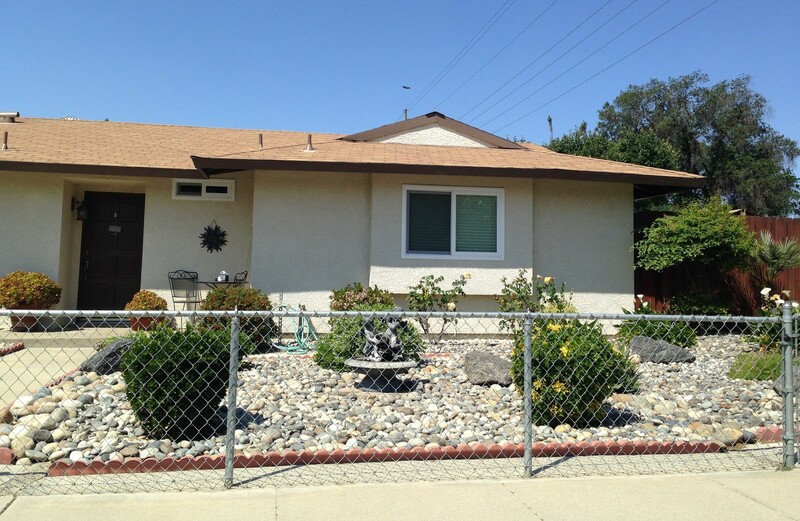 From a water conservation perspective, he and his wife Edna are model citizens. They collect water while they’re waiting for the kitchen sink and shower to heat up and use it to hand-water their plants. According to his calculations, they’ve reduced their personal water consumption nearly 40 percent over the last two years. Atkinson remembers how lush California seemed when he arrived as a child in the 1940s. He recalls going to an older brother’s house and marveling at his lawn. "The water was running, and sprinklers and this and that," he recalls. He also remembers his brother's response. "He said, 'No problem, $2 a month, use all you want,'" says Atkinson, who retains his Oklahoma twang. "Back when water was $2 a month, use all you want, ordinances of grass and no rock probably made sense for beauty. Doesn’t make any sense today, does it?" It's unclear just how many California cities will have to change their local ordinances under the governor's new drought mandate. A bill (mostly aimed at new developments) passed nearly a decade ago requiring cities and counties to adopt water-efficient landscape rules by 2010. But when asked to send their plans to the state Department of Water Resources, more than 150 cities didn’t even respond. Just down the road from Hanford, in the town of Corcoran, people come to pay their water bill at city hall. Many of them are farmworkers who pay in cash. In the lobby, framed yellowed newspapers on the walls tell the history of this cotton town, built on top of what was once the largest freshwater lake in the West. One headline reads: "Farmers Fear Floods." "We’re used to having water come in abundance, and sometimes having too much water," says Kindon Meik, city manager just down the road in Corcoran. "In fact, much of the western portion of the city is set up in the 100-year flood plain." For a long time, Corcoran residents have pretty much been able to water whenever they wanted. City parks and schools are still exempt from all watering restrictions, but as of this month, residents are limited to three days a week. The city can’t cut back watering days any further, under city code. "It’s very archaic,” says Meik of the code. “It’s set up on the idea that there’s going to be abundant water." But now, Corcoran -- which is entirely reliant on groundwater -- is drilling a new, deeper well to serve its 26,000 residents, half of whom are inmates at the state prison located there. The state water board says Corcoran will likely need to cut water use by 36 percent -- so Meik and the city council are scrambling to change the code before state-imposed drought rules kick in this summer. Then he’s got to find money to help with local enforcement. Right now, four people staff the water department. They’re mostly focused on water treatment and delivery, not knocking on doors to catch water wasters.